Fall is in the air in the Rockies and the Midwest and Northeast this weekend as both brace for some cool temperatures, and even some snow out west. Cold temperatures ushered in by a low will allow for the development of snow along the Rocky Mountains on Saturday. The National Weather Service has issued winter weather advisories and winter storm watches from Montana to New Mexico in advance of the frontal system. Travel will be treacherous in these areas Saturday afternoon and evening. 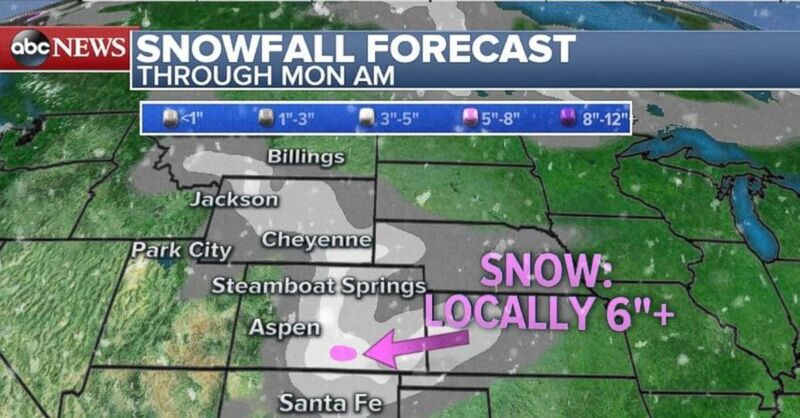 As much as 6 inches of snow could fall locally in part of Colorado through the weekend. In addition to the snowy weather, record-low temperatures for this time of year could be broken. Accumulations are possible from Montana through New Mexico, with the highest amounts occurring in Colorado. Lower elevations can expect 2 to 4 inches, while higher altitudes may see over 6 inches of snow. The Rockies aren’t the only area to see a decrease in temperatures. The Northeast is experiencing its first real taste of autumn this weekend, after a cold front passed through Thursday night heralding cool and dry air. The temperature will only be in the around 50 when the Red Sox kick off the American League Championship in Boston on Saturday night. The chilly temperatures will stick around this weekend with highs ranging from the high 40s in Pittsburgh on Saturday to 60 degrees in Boston on Sunday. The remnants of Sergio, which was once a Category 3 hurricane, will impact the Southern Plains this weekend. The system is moving into Texas from the southwest Saturday morning, and is beginning to draw in moisture from the Gulf of Mexico. Heavy rains and strong thunderstorms are ongoing threats with this storm system. The remnants of Sergio are moving through New Mexico and Texas on Saturday. 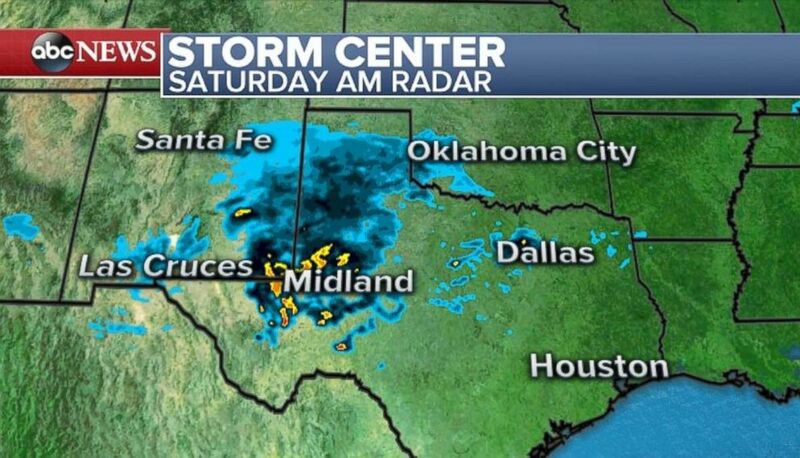 Radar images show that the remnants of Sergio are already impacting western Texas and eastern New Mexico on Saturday morning. Throughout the day, rounds of rain and thunderstorms will move from southwest to northeast through New Mexico and Texas. The inflow of moisture from the Gulf will help to sustain the storms and intensify the threat of flash flooding in the impacted areas. The National Weather Service has issued flash flood watches from New Mexico to Arkansas. Storms will drop 1 to 3 inches of rain over the course of just a few hours in Texas Saturday afternoon. Upwards of 6 inches of rain is expected in some spots once the remnants of Sergio have moved through. 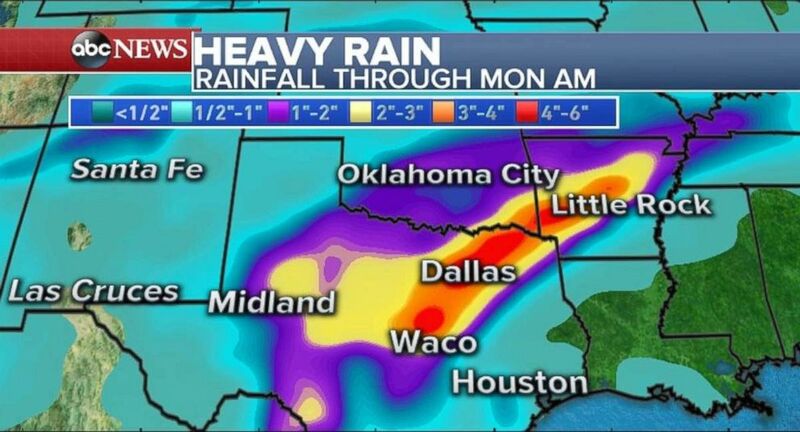 Rainfall totals from the remnants of Sergio could reach half a foot in eastern Texas and Arkansas this weekend.